Get the latest news from Akrilika! Stay informed on new products, expo reports and many-many more. INTERZUM ended on 19 May 2017 with record results. A total of approximately 69,000 visitors from 152 countries attended the world's largest trade fair for furniture production and interior construction between 16 and 19 May 2017. Some 1,732 exhibitors (2015: 1,537) from 60 countries presented their innovations at INTERZUM 2017. „It was the best interzum ever yet“, said Katharina C. Hamma, Chief Operating Officer of Koelnmesse GmbH. INTERZUM's international reach is not only increasing amongst exhibitors. The trade fair also attracted growing numbers of international visitors. The proportion of foreign visitors rose to around 74 per cent (2015: 71 per cent). Overall, more than 51,000 visitors came from outside Germany. Within Europe, increases in visitor figures were recorded in particular from the Netherlands (up 26 per cent), Spain (up 25 per cent), Italy (up 20 per cent) and Eastern Europe (up 46 per cent). Visitor numbers from Poland and the United Kingdom also rose. Considerable increases were seen in visitors from Asia, the Middle East, Africa, Australia/Oceania, North America and India. This year INTERZUM addressed some very exciting themes and ideas for trade visitors. It demonstrated that outstanding innovations in furniture production and interior construction are constantly being developed. New materials, technologies and design approaches were just some of the key areas that the trade fair focused on. With events such as this, INTERZUM underscored its focus on groundbreaking ideas and highlighted their importance to exhibitors. 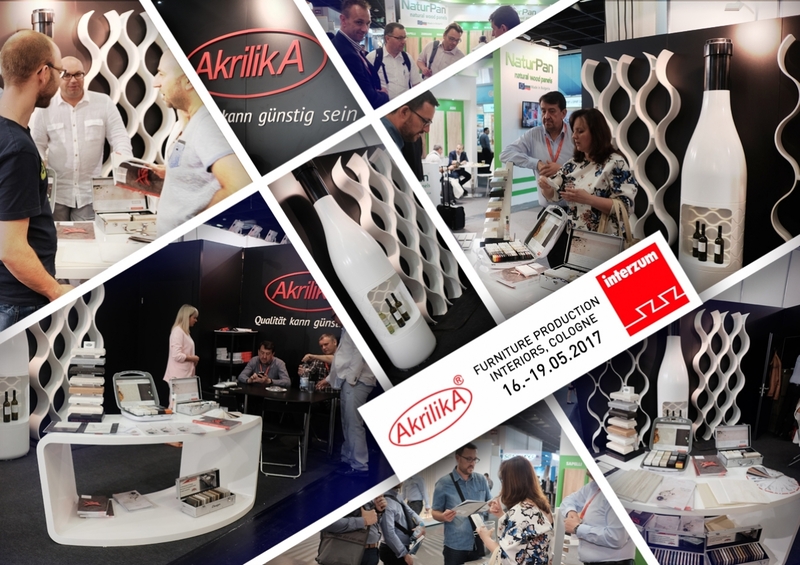 Akrilika's booth attracted attention not only with authentic decoration created of solid surface in partnership with ArtCor Company, but also with innovative solutions and materials within Akrilika product spectrum. The main object of the booth was the Riesling wine bottle made of bright white solid surface with a special niche in it, complemented by a led backlight. In addition to the bottle, a curved reception and two wave-style wall panels were fabricated.